American Express Work at Home Job – Pays $15+ Hourly! Published May 26, 2012 By Anna T. This post may contain affiliate links. Regardless, I only recommend sites I've researched and/or used and trust. Looking for information about American Express work at home job openings? You are in the right place. This company occasionally hires home-based workers to take calls. Additionally, this is one of the higher-paying phone jobs you can do from home. Note that American Express is not always hiring for these positions, but many readers ask me about working at home for them, so I've compiled some info. How much does American Express pay people to work at home? A recent job posting states the pay is $15.73. However, this rate is based on prior work experience. If you do well though, you can expect your pay to go up. 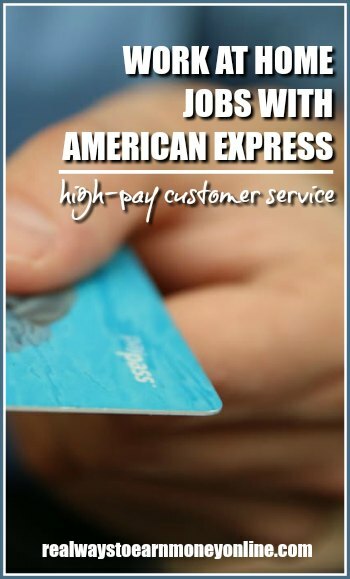 American Express claims some workers make over $20 an hour. What exactly do you do for American Express? You are primarily taking calls, helping customers with their accounts, answering questions, etc. You need to of course be able to provide a quiet background while you work. Does American Express pay you for training time? Yes, training is paid provided that your attendance is 100 percent. Are you hired as an independent contractor or an employee? I believe you are hired as an employee because they offer a benefits package with retirement, medical, dental, and vision. Most IC positions do not offer these kinds of benefits. For what it's worth, I've read that for the American Express home based jobs, your credit isn't checked. What is the scheduling like? This is a full-time position with 40 hour work weeks. If this sounds like too many hours for you, I have a list of part time work at home jobs to consider. American Express sometimes has home-based positions open in Canada and other countries. Additionally, they look for people with either a 4-year college degree or at least 4 years of customer service experience. I've heard that the American Express work at home job is top notch. They pay well and offer good benefits. If you have the required experience or a degree and think you can put in 40 hours a week, this might be a great work at home opportunity. How Do You Apply for American Express virtual jobs? Keep in mind the American Express work at home job is not always open. However, you can visit their jobs page and type in “virtual” and “work at home” in the keyword box to check for it at any time. Same here, as Dana. I have applied multiple times over 3 years. I did get one call back from a recruiter, but was at work and missed the call. He left his name and number in a voice message, which I returned within an hour of his call. Multiple calls and messages left on his voicemail, he never returned the call. I did get the dreaded “You were not selected for this position” e-mail.